Nearly $19 billion in state unemployment benefits were paid in error during the three years that ended in June, new Labor Department data show. The amount represents more than 10% of the $180 billion in jobless benefits paid nationwide during the period. 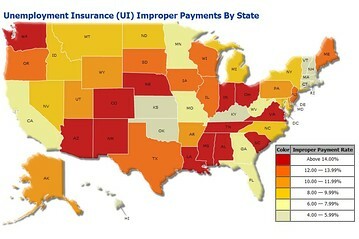 (See a sortable chart of each states’ overpayments) The tally covers state programs, which offer benefits for up to 26 weeks, from July 2008 to June 2011. Layers of federal programs that help provide benefits for up to 99 weeks weren’t included. The figures were released Wednesday as the Obama administration promotes its bid to reduce waste at federal agencies. The federal government foots the bill for administering the programs, and states are supposed to pay for the benefits. Many states exhausted their unemployment insurance trust funds during the long recession and slow recovery, prompting them to borrow from the federal government to replenish their funds. Thirty-one headquarters officers and employees of the National Education Association make $200,000 a year or more. Maybe Obama should have a chat with the union. Asking them for a little “shared sacrifice” would buy a lot of drums for music students!